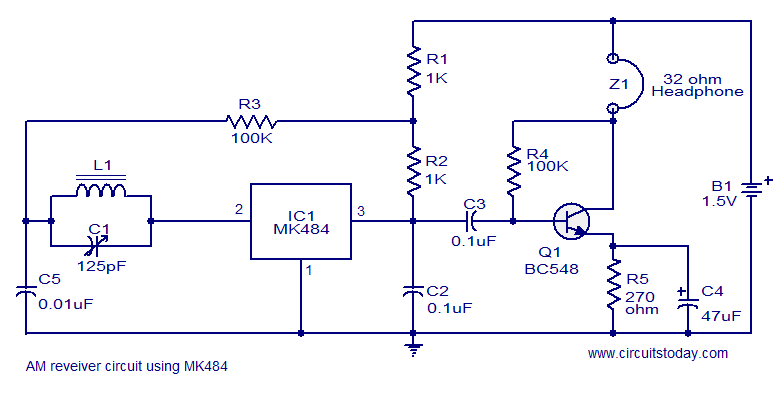 Low cost simple AM receiver circuit designed based on IC MK484 . A simple AM receiver circuit based on the MK484 AM receiver IC from Rapid Electronics Ltd is shown here. MK4844 is a monolithic integrated circuit that has all the necessary sections of a AM receiver like RF amplifier, detector, AGC etc. The IC is available in TO92 package and requires very few external components. In the circuit L1 and C1 forms a tank circuit. L1 also serves as the antenna coil. The audio signals available at the pin 3 of IC1 are amplified using the amplifier built around transistor Q1. C2 is a bypass capacitor while C3 is a DC decoupler. Capacitor C4 provides negative feedback while R4 biases the transistor Q1. Assemble the circuit on a vero board. Use a 1.5V cell for powering the circuit. Never give more than 2V to the circuit. It will destroy the IC. The MK484 can be operated over a range of 150 KHz to 3 MHz. For L1 make 90 turns of 36SWG enamelled copper wire on a 1cm diameter card board former. Experiment with thenumber of turns for getting optimum performance. A little trialÂ and error is needed. sir,ic mk484 or ys414 is not available in the market then which ic use in place of mk484.sir please tell me internal diagram of mk484. Try using 2nos BC549C in Darlington configuration in place of ZN414. output transistor should cost not more then 25cents each. maximum of 15 usd excluding the battery unless you are able to collect the components for a lower price from Your local market. I hope You have already constructed the received and the information will still be useful. homepage where You will find a lot of info for Your future circuits. Thanks for giving such a nice circuit for AM receiver.I have to build this for my project.I want to buy all these component used in the circuit online.Can you suggest me any online website for getting all these .And please also tell me how much it cost around..(approximately).waiting for your reply. The circuit is not of mine. However widely available in the internet and linked from my webpage reflected below.My webpage content refers to several circuits using old components and in addition detailed info about the construction of ZN414 receivers or equivalent IC’s. The webpage also gives an eBay shop selling TA7642 IC.Unfortunately the ZN414 is not available anymore or for a rather high price.So is MK484. anymore.The most easy to find IC is the TA 7642 and for a very reasonable price from the eBay seller in Hongkong which I refer to. The alternatives of TA 7642 are sold at a rather high price and high postage costs exceed the cost of the component.The above seller sells a pack of 10 .There is no need of investing so much money in order to find a ZN414 or MK484. I apologize from those who have been for a reply since a long time. There are several alternatives to ZN414. All these four IC’s can be found the first much easier and cheaper. housing(case).Both versions are oroginal Darlington transistors. most of them use 9V Batteries.One is already reflected among the circuts of this website with adjustable regeneration. The MK484 type receivers are very interesting for good results with minimum number of components. above mentioned homepage and related subject for a reliable source. transistor being an alternative to any four of the ZN414- MK484-TA7642 or LMF501T IC’s to construct an AM Radio.Both of the former PNP or NPN transistors can be used in Darlington Configuration.The wording two transistors in one housing/case is erroneously mentioned.Both of them are single transistors and are recommended due to being manufactured in identical parameters.No need to add the use of either two PNP or two NPN transistors due to different battery polarity. sir i required internal schematic dig of ic mk 484 because of this ic is not available in the market. please give me the internal schematic digram of ic mk484. i need it very urgent.